Opera announced the launch of the first Web 3-ready browser at Hard Fork Decentralized London today. 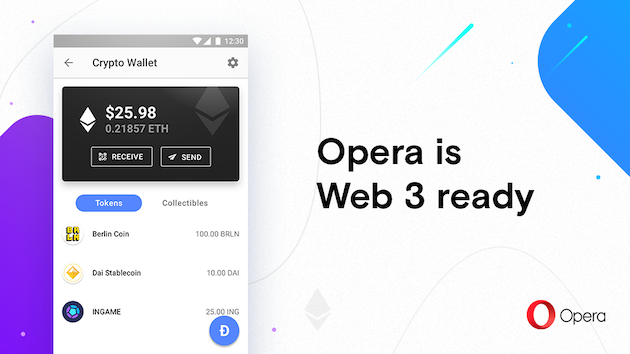 The Opera browser for Android devices now features crypto wallet integration and Web 3 support. With the newest version of Opera, people who use the traditional web now also gain easy access to Web 3, the exciting internet of tomorrow. This means that the more than two billion people who use Android can now get a Web 3 experience through the Opera browser. Opera believes that the web of today will be the interface to the decentralized web of tomorrow (Web 3). With a built-in crypto wallet, the browser has the potential to renew and extend its important role as a tool to access information, make transactions online and manage users’ online identity in a way that gives them more control. Web 3 still faces many challenges before reaching wider adoption. These barriers range from users’ understanding of new terminology, to difficulties in acquiring cryptocurrency and to complicated installation procedures. People, however, are more likely to adopt new solutions if they are user-friendly and seamless. With this release, Opera is providing exactly such a tool with the hope that integrating Web 3 alongside the current web will make the technology more mainstream. “Until now using cryptocurrencies online and accessing Web 3 required special apps or extensions, making it difficult for people to even try it out. Our new browser removes that friction”, said Charles Hamel, Product Manager of Opera Crypto. Opera for Android now supports Ethereum, a popular and quickly growing protocol that allows people to make transactions and developers to create decentralized apps (Dapps), which provide practical use for this technology. “Users can now use Opera to access these emerging Dapps. We’ve decided to support Ethereum, as it has the largest community of developers building Dapps and has gathered a lot of momentum behind it. Opera with Crypto Wallet supports the Ethereum Web3 API, making interacting with these Dapps seamless to the user. We believe all browsers will eventually integrate some kind of wallet, which will enable new business models to emerge on the web”, added Hamel. Opera for Android will access the Ethereum blockchain through Infura, an infrastructure platform that provides secure, reliable, and scalable access to Ethereum. “It’s a significant step for one of the world’s leading browsers to add an ethereum-based crypto wallet and Dapp explorer, and speaks to Opera’s innovative roots and commitment to embracing next generation technology. We see this as an important moment in improving dapp accessibility, opening Web3 to mainstream audiences, and encouraging developers to build on Ethereum”, said Joseph Lubin, Ethereum co-founder and founder of ConsenSys, a venture studio that invests in projects building the Ethereum ecosystem, such as Infura. To try out the new web of tomorrow, users first have to download Opera from the Play Store (on Android devices). In order to start making actual Web 3 transactions, they also need to purchase some Ethereum cryptocurrency and store it in their Opera Crypto Wallet. 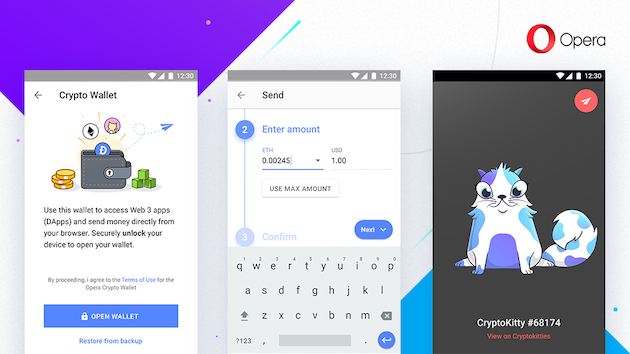 Once the cryptocurrency is stored, users can access a selection of Web 3 apps in the Dapp (decentralized application) store, accessible from within the browser’s built-in Crypto Wallet. In November 2018, Opera announced a partnership with the leading strategic blockchain advisory and financial services firm, Ledger Capital, to work on the potential of the blockchain ecosystem. As a further step, the company plans to also make its PC browser (Windows, Mac, Linux) Web 3 ready in 2019. The browser can already be tested in its developer version.